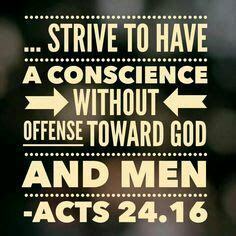 In view of this, I also do my best to maintain always a blameless conscience both before God and before men. 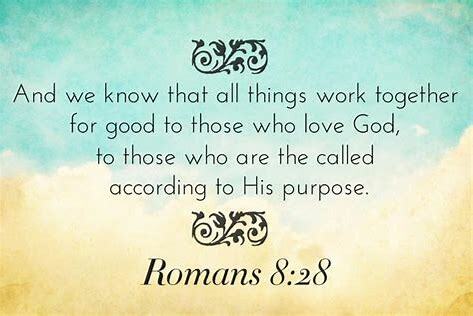 Have you taken great pains to have a clean conscience before God and man or, have you allowed the world to instruct you to ignore your guilt feelings and make your conscience weak? This is a dangerous way to live your life as a Christian. God has graciously given you something within that is powerful to assist you in the struggle against sin. He gave you a conscience, and that conscience can bring you real pleasure and freedom. Examining your guilt feelings in the light of Scripture and then confessing and forsaking your sin will cleanse your conscience. Dealing with sin immediately is a continuous quality or aspect of the Christian life. It is a privilege and joy to walk before God with a clear conscience. Sometimes people think their guilty conscience will just clear up over time without dealing with it. But, guilt feelings can remain for long periods of time, and appear in other areas of life causing one to feel guilty and not knowing the reason for it. This could be a sign that something is definitely wrong spiritually (Titus 1:15). A weak conscience that is easily grieved is a result of a lack of knowledge and understanding of the Word of God. You need to respond to your conscience, even if it's weak and continue to learn from God's Word. It would be wise to never ignore your conscience or to live by your feelings only (Jeremiah 17:9; Romans 8:26-27). The Spirit of God helps us in our weaknesses, our infirmities, and searches the heart of man. What is your conscience trying to say to you? Can you respond with Paul in saying, “I have lived in all good conscience before God until this day” (Acts 23:1)? Christians need to fight to keep a pure and good conscience every day. Lord, may I keep a clear conscience that is right before You and others. Up to this time, David’s life has been filled with war, bloodshed, and trouble. David is now resting from his enemies, and a thought comes to mind, a desire to build a special dwelling place for the Ark of the Covenant. The prophet Nathan is introduced in Scripture for the first time and will later record many of the events surrounding David’s life. We must remember that Nathan is human––like the rest of us and the proposal David gave him sounded great. Nathan would have a new “church” in which to worship the Lord in, so he responded quickly. How did Nathan know God would want a building? Had Nathan talked to God about it? Maybe he reasoned as many of us do. “If it’s in the name of God, it must be okay.” That night as Nathan lay down to sleep, the LORD spoke to him and Nathan realized that he had spoken too soon, and would now have to go to David to admit that he had been wrong. Though God had said, “No” to David’s dream of building the temple, He did give to David many blessings. One blessing would be that his son, Solomon, would be allowed to build the temple. We, as children of God, do not have the same promises as David did. But, God has promised that when we hurt, He will be there, when we cry out, He will hear our voice and when we believe and call upon His name, we will be saved. What has happened in your life? Has God told you “No” to the most important desires you have longed for? Did that answer make you bitter against Him or are you better because of God’s sovereign work in your life (Romans 8:28)? I pray you will allow the Maker of this universe to do His work in your life even when He says, “No” to your heart’s greatest longing, and the things you treasure and hold so dear. Lord, my heart’s desire is to do Your will. As the love story of Ruth unfolds, picture three women traveling along the road toward Bethlehem. Their hearts are broken by death, they’re in despair and most likely afraid. Naomi stops them on their journey and lovingly reminds them of the reality of their devastated lives. She relays to them that she has no more children for them to marry and if she would have children, they would be too young to marry. They would be better off going home to their families than to continue with her. Ruth said to Naomi, “Do not urge me to leave you or to turn back from following you. I want to go where you go, and live where you live. I want your people to be my people, and your God, my God. Where you die, I want to die and be buried. May the LORD do to me and more, if anything but death parts you and me.” (Paraphrased). Orpah shows her love for Naomi, kisses her mother-in-law good-bye and walks away back to her gods. Ruth is grieved and weeps as Orpah disappears forever out of their sight. With already so much tragedy and heartache they have endured, to know Orpah would cease to exist in their lives from this time forward, would seem unbearable. Ruth cleaves to her mother-in-law, expressing words of love and devotion to Naomi and to her God. Her words confirm her devoted love for Naomi but most importantly, they show Ruth’s obvious conversion from worshipping Chemosh to the God of Israel, JEHOVAH. Have you ever wondered how God could save such a sinner as you, as Ruth, or anyone? You will never understand the meaning of the cross, or why Jesus had to die until you begin to appreciate the depth of love shown in His extreme sacrifice. 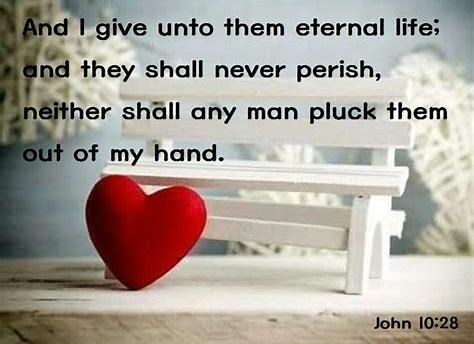 He was willing to give His life for your eternal soul, an everlasting love that will not let you go. Lord, thank You for a love that will never let me go (John 10:28). 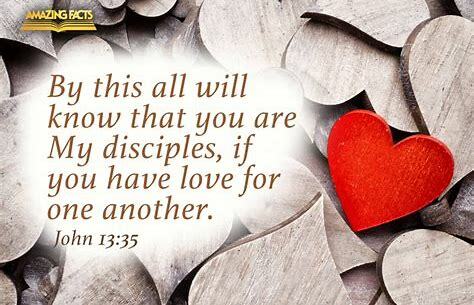 Jesus said in John 13:35 KJV, “By this shall all men know that ye are my disciples, if ye have love one to another.” Making the choice to love others is a command given by our Lord to those who would call themselves Christians. The Bible never defines love but describes it. Love is an action word and love is only love when it acts. The true Christian is one who loves when he is hurt, wounded, or taken advantage of without seeking revenge. Abraham Lincoln made a lot of friends, and he also made some enemies during our great Civil War. Edwin Stanton, Secretary of War, during President Lincoln’s administration was said to be; rude, explosive, dogmatic, and obstinate. Yet, Lincoln chose him for that particular job. History teaches us though Stanton was rude and abrasive, he couldn't resist the patience that Lincoln showed him. Stanton couldn't resist the non-retaliating spirit of the man called, Lincoln. Love forgives seventy times seven when it has been wronged. Long-suffering endures the insults and injuries of others and kindness pays them back only with deeds of goodness, and unfeigned love. The night of Lincoln’s assassination, in the little room where the President's body was taken there stood Stanton. He was peering down into the silent face of the President in all its ruggedness and is reported to have uttered this famous remark, "Now he belongs to the ages." Stanton knew the kind of man President Lincoln was and appreciated the kind-hearted spirit he shared with those that served with him. Lord, may I learn to share my love by what I do and not only by what I say.